Are you stuck for ideas on what to put inside those tiny plastic eggs for your big Spring Easter Egg Hunt? Trying to avoid loading your kids up with sacks of sweets just to make their egg hunt “interesting”? Back in the good ol’ days, we decorated hard boiled eggs that the Easter Bunny would hide for us. He’d leave a basket of candy our kitchen table. Then parents decided no one wanted to eat a potential salmonella bomb, and the real eggs went right back into the fridge. Plastic eggs are great for food safety, but what the heck do you put in them?? For the longest time I resorted to small candies and coins. The kids loved emptying their egg loot into a basket, but it was pretty repetitive. “Candy!” Dump. “Candy!” Dump. “Um, more candy?” Dump. This year the Easter Bunny is going to take things up a notch and put INTERESTING goodies in those eggs! Make a couple cute little animals from felt and stuff in the eggs as a fun surprise! Make tiny little felt bunnies! Or if you’re not quite THAT crafty, how about some no-sew chicks? You could fill your kid’s Easter Eggs with “Bunny Money”–cute little coupons good for extra privileges like bonus screen time, a chore free day or a special treat. Put little inspirational notes in your eggs. And maybe a treat too. Fill your eggs with tiny dinos! You can eggs at Amazon that are already filled and ready to roar! Everyone loves unicorns! You can find tiny egg sized unicorns in a whole bunch of styles from plastic to plush. Here’s a cool idea! Tiny finger puppets! This set has all kinds of animals, so you can keep playing with them past Easter. Get squishy! Here’s a whole herd of cute and silly animal toys–and they come pre-stuffed in their eggs! How about eggs full of LEGO guys? Did you know you can buy Mini Figs indivually at a local LEGO store? At our West County store you can custom build a set of three LEGO people, or pick up a mystery bag. There’s also sets that are just filled with Mini Figs! How about eggs filled with LEGO-like construction vehicles? This one is definitely on my list! Mitch loves Magic…so I’m gonna get a whole basket of magic trick eggs. Do you have a little fashionista? She might like these eggs filled with cute hair bows! Most of these pre-filled eggs are fairly cheap, but what if you don’t want to give your kid 12 or 30 of the same type of toy? Then team up with your mom friends, buy several kinds of egg sets and swap! 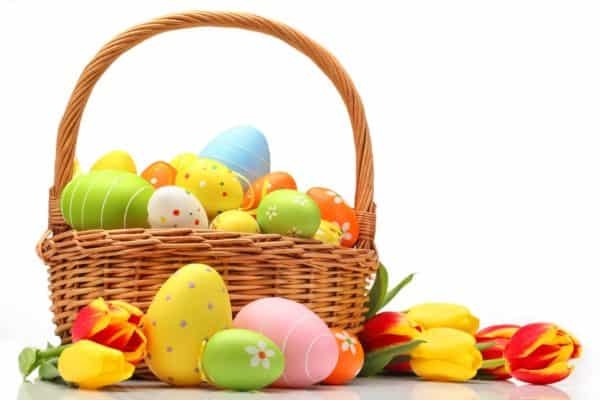 Then each family can have a variety of fantastic egg surprises!